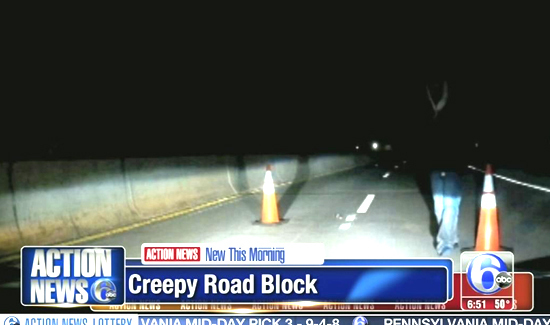 You’re driving home from work on the turnpike in the early morning hours. Up ahead on the road you can see a guy with a flashlight and some orange cones set up. Is it a DUI checkpoint? Was there an accident and traffic is being diverted? Or is it just a violent criminal using the pretext of a roadblock to rob people- possibly at gunpoint? Who knows? What we do know is that the guy that shot the video made the right decision in getting the hell out of there. UPDATE: watch the video above, then CLICK HERE to find out the rest of the story.